Bizarre Letter From Frontier Communications? Every year, Frontier negotiates contracts with local TV broadcasters and national cable networks to offer their programming. Some are demanding unreasonable rate increases. Frontier is working hard to negotiate a fair deal and avoid any channel disruption by the broadcasters. We understand how important your local programming is to you and we apologize for the inconvenience. Our goal is to deliver the highest quality in TV entertainment at the best value for your money. If any stations are removed from your lineup, Frontier will work on your behalf to return those channels to your lineup as soon as possible and at a reasonable rate. As always, thank you for being a Frontier customer! 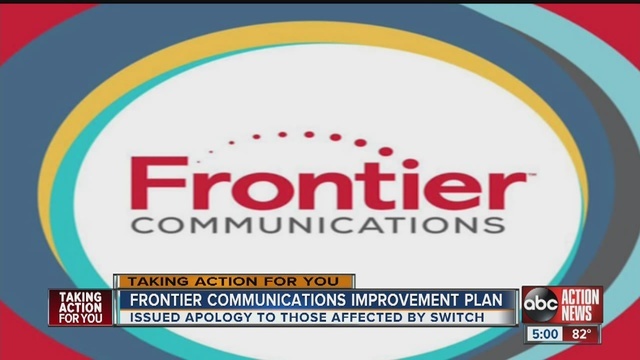 UPDATE: Frontier continues negotiations with local TV broadcasters who are demanding unreasonable rate increases. Channels listed below may be removed at any time. If any of your channels are impacted, Frontier will provide further details on this page. Zero rating has become the center of the net neutrality debate. Toll free data or sponsored data is the practice of mobile network operators (MNO), mobile virtual network operators (MVNO), and Internet service providers (ISP) who do not to charge customers for data used by specific applications or internet services through their network or is limited or metered. Zero rating plans exempt particular data from counting against a user's data cap, or from accruing any excess usage charges. A zero rating may provide an unfair advantage to the provider of the content that is zero rated, compared to other content providers or potential new entrants. 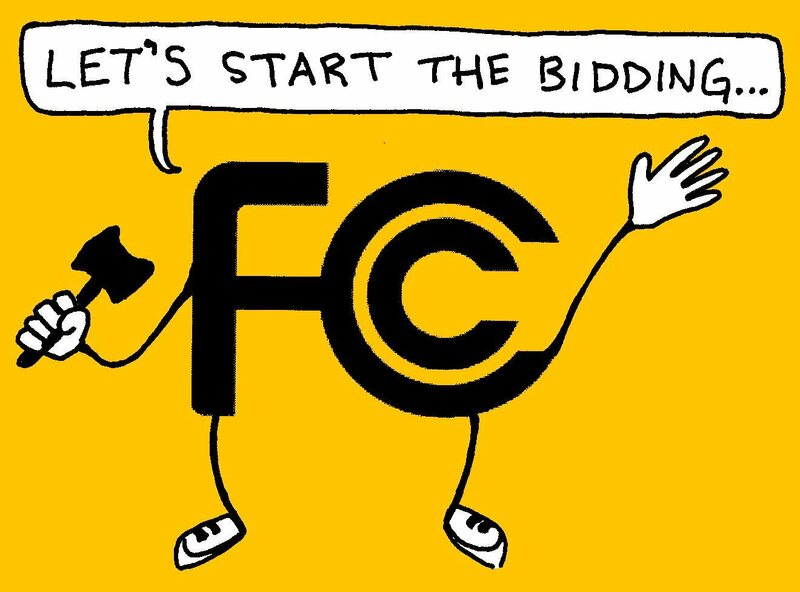 India recently decided to reject zero rating plans such as Facebook's Free Basics, while in the United States carriers push boundaries with zero rating experiments such as T-Mobile's Binge-On plan, as well as AT&T's Sponsored Data, Verizon's FreeBee, and Comcast's Stream TV. Read more. The nation’s two largest wireless carriers have told the FCC to ease up on its probe of zero-rated mobile data policies. But the issue may soon be moot anyway under President-elect Donald Trump’s administration. The commission recently sent letters to both Verizon and AT&T warning that their policies for zero-rated content could harm competition and consumers. The model enables users to consume specific types of video and other content on mobile devices without incurring wireless data charges. AT&T zero-rates content from its recently launched DirecTV Now for its wireless customers; Verizon does the same with its Go90 offering. Read more. Critics claim zero-rated data policies violate net neutrality principles because they give some content providers an advantage over others. The issue has become increasingly contentious as wireless carriers expand into media, enabling them to offer their own content to customers at no cost. All blanks or entries with nothing in the description have been deleted. 78,289 records were in the database as of today and approximately 28,320 were deleted because they were left blank or didn't have any description of the reception problem. There are 49,969 active records in the database from 2008-2016 as of today. Dates have been added to all entries and you can search by year or month. Record numbers have been added to all entries from 2008-2016. If you see a number between 1-49,696 then it has been added to the database before December 16, 2016. If carriers or customers think reception problems have been fixed that are currently on the map. Simply send us a list of the records that you would like to deleted. A description of why we should delete would also be helpful. Search the map by data or description for a particular problem by city, state, zip or by a keyword in the description. (Example: "school", "hospital", "airport"). 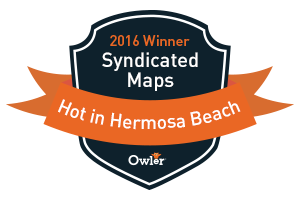 Every point on the map will have some context of the problem a customer is experiencing. We will not longer be keeping blank data entries on the map. Email us if you would like a download of a particular region. Is Net Neutrality at Risk With Tom Wheeler's Resignation? The Federal Communications Commission has been led by Chairman Tom Wheeler for the past three years, but Wheeler intends to end his run at the FCC on January 20, 2017. Wheeler, a former lobbyist for the telecommunications industry, was nominated by President Obama to head the FCC in 2013. His appointment initially drew the ire of consumer advocate groups, because of his background. 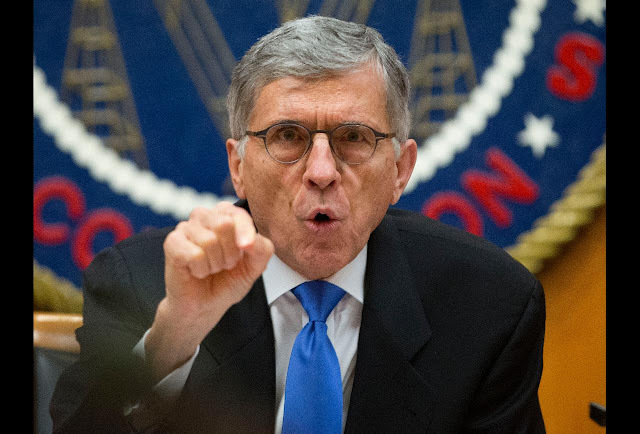 Wheeler’s record in his position has shown that initial fears were misplaced, however, as he oversaw an FCC that enacted rules to protect net neutrality and withstood a challenge in a federal appeals court. The writing was essentially on the wall for Wheeler, however, facing the prospect of a Donald Trump administration. As Recode pointed out, the Senate recently failed to reconfirm one of the FCC’s other leaders, Jessica Roseworcel, who has been a staunch advocate for net neutrality, a policy which Trump has opposed in public. Does Your Car Have WIFI? Having Wifi in your car is pretty cool especially when you have kids who want to surf the web and use devices that don't have data plans. 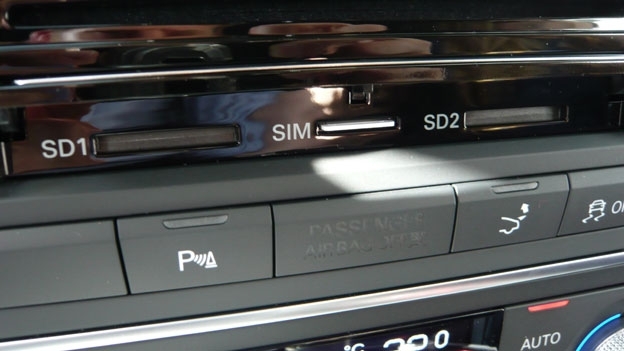 Most new cars these days have the ability to plug in a SIM card directly into the dashboard. This allows you to connect your navigation system and entire car. Republic Wireless will spin out from its parent company and become an independent entity, a sign that cheaper, Wi-Fi-based cellphone services are able to stand on their own in a hotly competitive wireless market. David Morken, chief executive of Republic parent Bandwidth.com, said in an interview that spinning off the Wi-Fi cell unit made sense, as more of Bandwidth.com’s customers have become direct competitors to Republic, and as Republic itself became more viable. Bandwidth.com, which sells voice and data services to businesses, provides phone numbers and telecom services to rival Wi-Fi first cellular services like Alphabet’s Project Fi, as well as to Microsoft’s Skype and Google Voice. Raleigh, N.C.-based Republic Wireless, which began selling service in 2011, has more than 300,000 subscribers and annual revenue of more than $100 million. Republic offers monthly mobile phone subscriptions starting at $15 a month. Republic Wireless sends most of its voice, text and data traffic over Wi-Fi hot spots. When Wi-Fi isn’t available, Republic taps into the network of a national wireless carrier, such as Sprint or T-Mobile US. After the spin-off, Mr. Morken will pass the role of Republic CEO to co-founder and operating chief Chris Chuang while keeping his role as chairman. Despite what the map says there is no T-Mobile cell phone coverage in this area of Highway 74. If you like to use your phone to make Wifi phone calls when you have a poor signal than T-Mobile might be the right carrier for you. Carrier cellular signals are sometimes hard to get, but if you have a consistent wifi signal then making calls through wifi might be your best bet. Here are some great Black Friday, Cyber Monday and Christmas shopping deals. A new piece of research could offer welcome news for smartphone users struggling with poor signals, slow downloads, and short battery life. Researchers at the Radio Science and Engineering Department at Finland's Aalto University have developed a digital antenna design that is expected to improve reception, data-transfer speed, and power consumption. 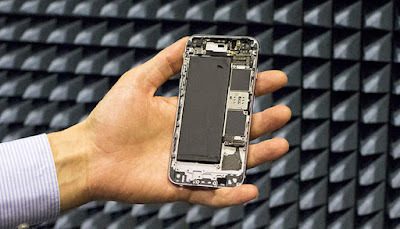 Currently, smartphones have multiple antennas that each work with one or several frequencies dedicated to specific smartphone applications, such as cellular reception, GPS, and Bluetooth. The new method is set to change this approach by combining several small antenna elements together as a single aerial, which can be controlled digitally to operate at any frequency. Viikari compares this approach to a guitar where a single open string could digitally be made to produce a different note. When one compact antenna can be used for multiple frequencies, it frees up space for the likes of larger touchscreens, thanks to smaller bezels, without sacrificing the phone's performance. But the new digital method promises to give the antenna greater bandwidth, which results in better radiation efficiency and the 100 to 1,000 times faster data transfer speeds set as an objective for the next-generation of 5G smartphones. Read more. Trump: Do We Need 1,700 FCC Employees? In staffing his FCC transition team, President-elect Donald Trump has tapped a pair of American Enterprise Institute (AEI) vets and free market de-regulators in Jeffrey Eisenach and Mark Jamison. Do these guys actually understand what is going on with spectrum hoarding? It is very important to keep radio spectrum allocation independent of day-to-day political pressures. Traditionally even deregulatory Republicans conceded there needs to be some spectrum cop on the beat. But who is actually doing the policing? Shouldn't we have a free market for spectrum licensing in smaller markets where customers are getting screwed with no coverage? 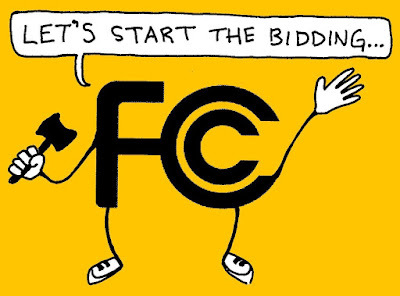 FCC regulation is about disappointing people at a rate that they can endure. 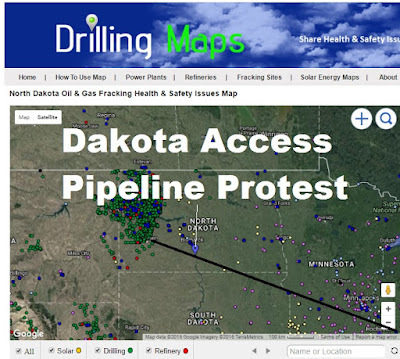 N.D. Access Pipeline Protesters Claim "Cell Networks Are Jammed"
North Dakota Access Pipeline protesters believe local and State authorities have jammed cellphone coverage during an operation to force activists from a camp they had set up on private land. However, authorities dispute that, saying the spotty nature of cellphone coverage in the remote area is to blame. More Info. According to the Deadcellzones.com map of North Dakota there have not been many cell phone coverage complaints in the area submitted to the map. However, this could be due to the fact that not a lot of people live or commute in this area. We anticipate after writing this article that coverage complaints will likely be submitted. Check back soon for an update. 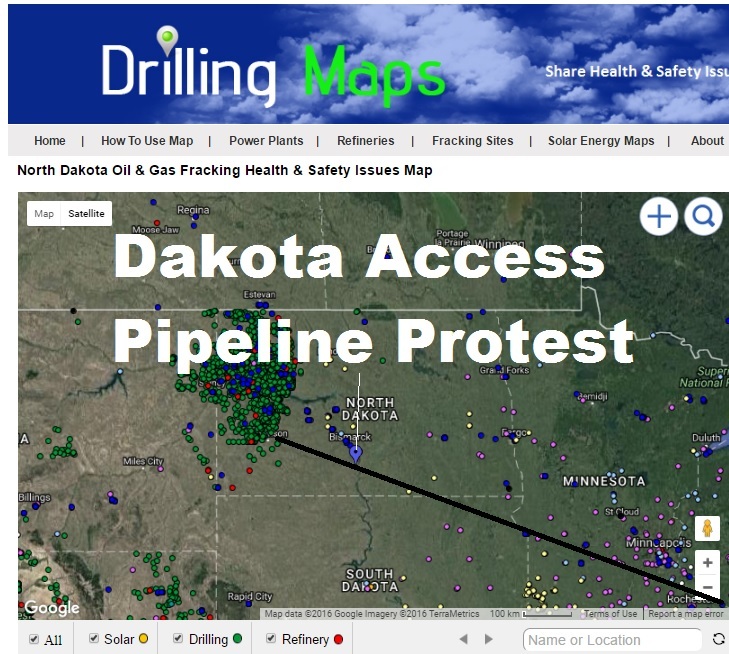 Where is the Dakota Access Pipeline Protest? Here is a map. Phone.com - Virtual Office solution provides local or toll-free 800 numbers (including vanity numbers) for business and manages them according to the customers' specifications. The virtual office service includes custom greetings, auto attendant, voicemail, internet fax receiving, call transfer and many more features you would expect from a more costly business phone system, all at a very affordable cost. Home Phone Service with Phone.com- Simplest way to set up a flexible, low cost with all the features and options to make it exactly what you want. Phone.com is the #1 Cloud Phone Service for small businesses and entrepreneurs. Phone.com offers innovative, customizable and cost-effective communications solutions with plans as low as $9.99 per month. Come see why more than 25,000 companies across the U.S., count on Phone.com for reliable Cloud PBX phone service and award-winning support. Sign up for a Free 30-Day trial. Home Phone Service with Phone.com- Simplest way to set up a flexible, low cost with all the features and options to make it exactly what you want. Get Home Phone Service with Advanced Features for Less than You're Paying Now. Never be disconnected from your team again. Empower your passion and staff with the most flexible communications technology today from Phone.com! Get Toll Free Numbers for Your Business with Phone.com! Get First 6 Months 10% Off Coupon - Get 10% Off on the First 6 Month by using code: TENOFF at Phone.com. If you have cell phone coverage problems in your home, we might suggest purchasing a cell phone booster. 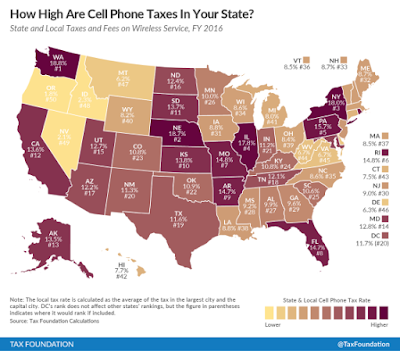 18.6% of the average wireless customer’s bill goes to federal and state taxes and fees. Put another way, a family of four that pays $100 a month for their cell phone plan will pay about $225 a year in taxes, fees, and government surcharges. Most customers pay a variety of fees on their wireless bills, including federally mandated charges, plus state and local taxes — as well as surcharges imposed by the carriers as a way to recover the costs of divvying up the money to the required agencies. 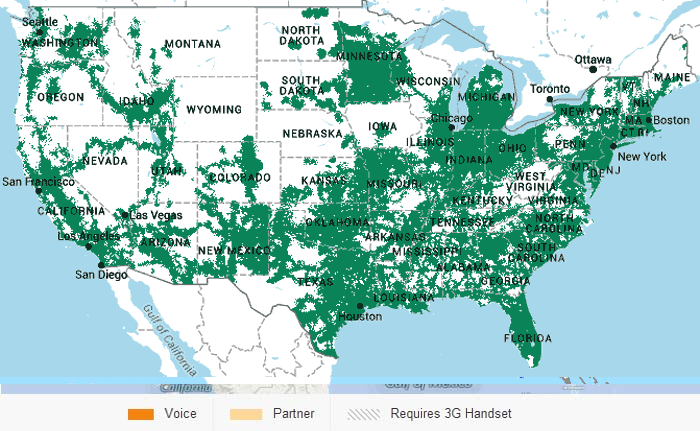 Which City Gets The Most Cell Phone Coverage Complaints? We analyzed the visitor traffic on Deadcellzones.com's regional & City pages of visitor traffic. The City & regional ranked pages are below by the most amount of visitor traffic we have received to our individual pages. Visitors find these pages typically by typing into search engines "cell phone coverage in Las Vegas" for example. We came up with our own ranking based on the number of complaints, traffic and activity on a page to determine which States were neglected by the carriers the most. If we ranked by traffic along this would skew heavily the densely populated Cities: New York, Chicago, Los Angeles, Columbus, Houston, Dallas, San Francisco, Washington DC and Denver. 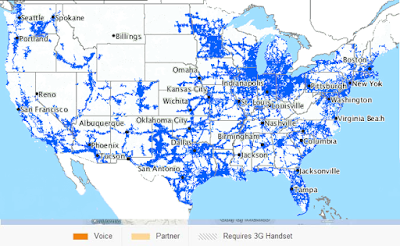 If you click on the individual City and regional pages below you can see a discussion about which carriers typically have the best and worst coverage in the area. You can also view the complaints by color on the map. 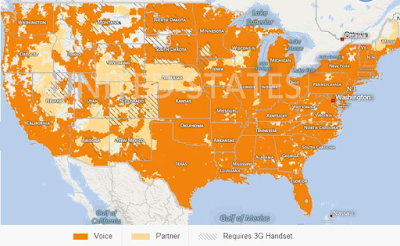 Which State Get The Most Cell Phone Coverage Complaints? 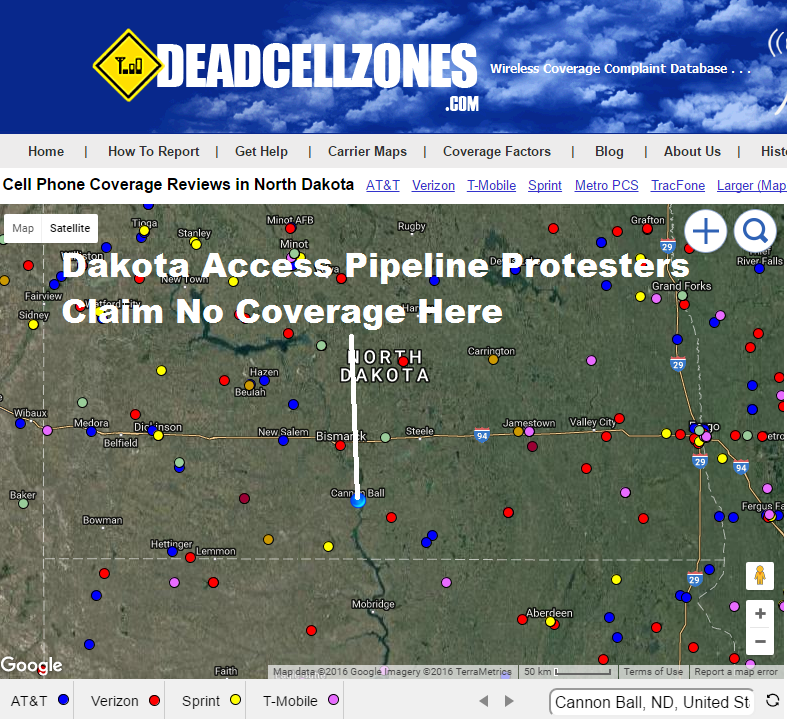 We analyzed the visitor traffic on Deadcellzones.com's regional State pages of visitor traffic. The States are ranked below by the most amount of visitor traffic we receive to our individual pages. Individuals find these pages typically by typing into search engines "cell phone coverage in Maine" for example. The ranking below is by the most amount of traffic on our individual State pages and dead zone complaints received on the map. We came up with our own ranking based on the number of complaints, traffic and activity on a page to determine which States were neglected by the carriers the most. If we ranked by traffic along this would skew heavily the densely populated States: California, Texas, New York, Florida, etc. 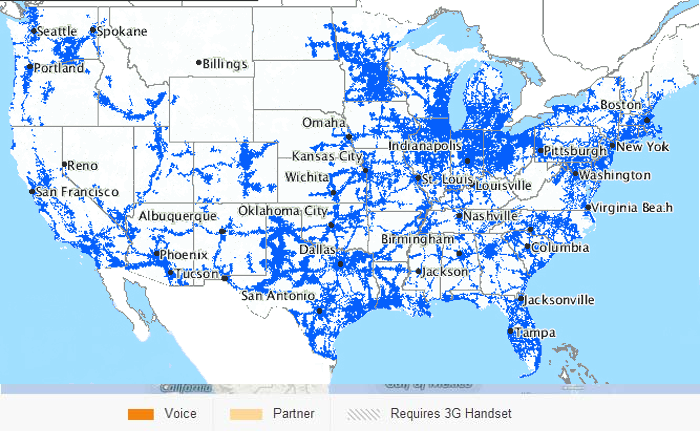 If you click on the individual State pages below you can see a discussion about which carriers typically have the best and worst coverage in the area. You can also view the complaints by color on the map. 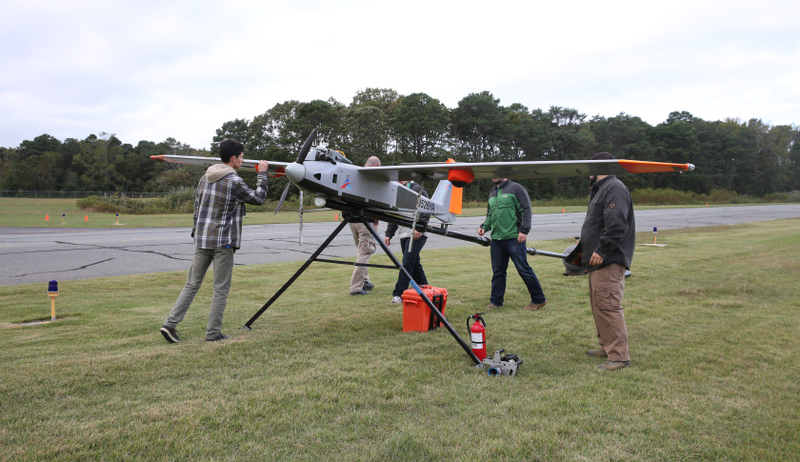 Can Drones Help Cell Phone Dead Zones? Verizon Communications is testing the deployment of large-scale drones to provide mobile connectivity in emergency situations when the land-based cellular network has been damaged. But the carrier hopes the trials will also entice corporate customers who may want to use the connected drones for new business applications. Read more. AT&T suggested in a blog post that it may consider using drones to provide better cell coverage at major public events like music festivals and sporting events. It is notoriously difficult for cellular carriers to provide adequate coverage to such large gatherings: cell towers often get overloaded with voice and data traffic during these events. So carriers normally bring in trucks loaded with equipment that helps extend cellular coverage to large gatherings. Read more. Why Did Google Give Verizon an Exclusive For The Pixel Phone? We think because Google will also sell its brand-new Pixel and Pixel XL via the company's Project Fi mobile network. The Pixels fully support Fi's network switching between T-Mobile, Sprint, and US Cellular. Not exactly an exclusive is it? Verizon and Google have a long, tense history of working together with respect to Google's hardware. Five years ago, the Galaxy Nexus had a strange and slow rollout on the network. Verizon was also stingy with software updates once the phone was out. It didn't stop there — the Nexus 4 wound up being incompatible with the network, the Nexus 5 was skipped entirely, and the Nexus 6 was another product that Verizon customers had to wait for. The two sides even butted heads over Google's Nexus tablets, too. That said, leaks of the Pixel and Pixel XL showed a glimmer of hope: no Verizon branding can be found on the phones. 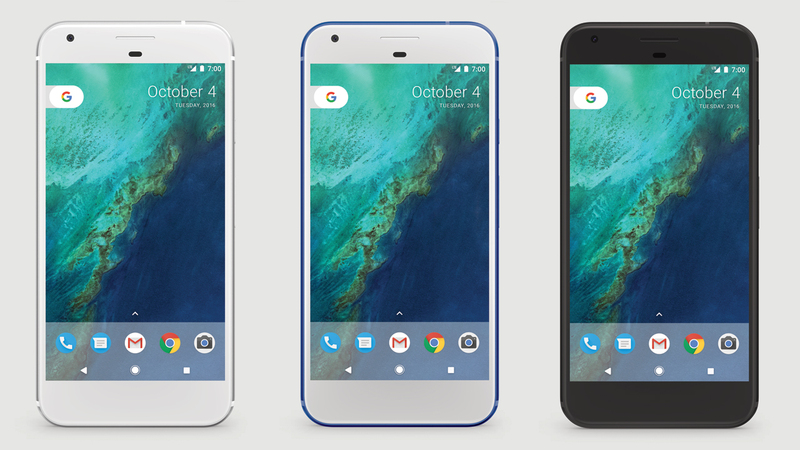 Google on Tuesday named Verizon as the exclusive U.S. wireless carrier for its new Pixel smartphone. The new Pixel smartphone comes in 5.5-inch and 5-inch versions and features an aluminum unibody, AMOLED display, Qualcomm Snapdragon 821 chip, a quad core processor, 4 GB of RAM, a fingerprint sensor, 32 GB and 128 GB memory options, an 8 mp front camera and a 12.3 mp rear camera. The device also comes with either a 2,770 mAh or 3,450 mAh battery that can achieve 7 hours of life on 15 minutes of charge time, Google said. It comes in three colors: black, blue and silver. Google’s new artificial intelligence Assistant and compatibility with the company’s Daydream View virtual reality headset will come built in to the device. The Pixel will run on Google’s latest Android Nougat operating system, the company said. While the device will also be offered unlocked for $649 through the Google store, Verizon will be the sole U.S. wireless provider carrying the device, Google said. Verizon said the 32 GB 5-inch Pixel device will run customers $27.08 per month on a 24-month equipment installment plan or $649.99 full retail, while the 128GB Pixel will cost $31.24 per month for 24 months or $749.99 retail. The 5.5-inch Pixel XL will cost $32.08 per month for the 32GB model on a two-year installment plan or $769.99 retail, and the 128GB Pixel XL will cost $36.24 per month on an installment plan or $869.99 retail. Divvy Mobile is a prepaid wireless MVNO that operates on AT&T's GSM, UMTS, & LTE networks. Divvy encourages its' members to advertise the operator with social media. Divvy mobile data plans can be found below. You can purchase a Divvy Mobile SIM card, which can be done on the Divvymobile.com website. Once you have the SIM card in your possession, you can either Activate a New Phone Number or Port Your Existing Phone Number. Eco Wireless is a prepaid wireless MVNO that operates on Sprint's CDMA & LTE networks. You can purchase a Ecomobile SIM card, which can be done on the Ecomobile.com website. Once you have the SIM card in your possession, you can either Activate a New Phone Number or Port Your Existing Phone Number. 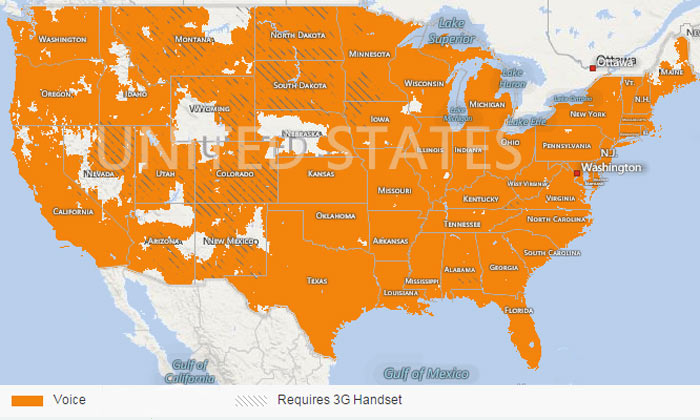 Credo Mobile is a prepaid wireless MVNO that operates on Verizon's LTE & CDMA networks. Data plans can share across devices. Each device pays an additional monthly line access fee — $40 for smartphones w/ 2-year contract (save $20/mo with the Installment Plan or BYOP), $30 for basic and messaging phones, and $10 for tablets — and each phone gets unlimited talk & text. You’re shopping for 1 device. To share data among multiple devices, select a different number above. The company donates 1% of customer charges to nonprofit and activism groups which is division of Working Assets. Chit Chat Mobile is a prepaid wireless MVNO that operates on Sprint's CDMA and LTE network. You can purchase a Chit Chat Mobile Mobile SIM card, which can be done on the CellNUVO.com website. Once you have the SIM card in your possession, you can either Activate a New Phone Number or Port Your Existing Phone Number. Please submit your reviews of the service and coverage below in the discussion. Will Verizon Try & Buy SiriusXM? I have this sneaking suspicion that Verizon might try and buy SiirusXM. Why? So they can charge you for more data on their cell networks. SiriusXM seems to be struggling to maintain their satellite network quality and more customers are streaming radio content on their phones through wifi and cellular networks. SiriusXM customers have been experience a lot of dropped signal issues and I suspect that without any competitors that SiriusXM is not going to invest much in the network to maintain service levels. Satellite networks must be very expensive to maintain and wireless carriers are probably looking at becoming at the premium radio subscription business as way to keep customers. AT&T purchased direct TV and now has a satellite company. Verizon continues to look buying content companies and satellite subscription radio seems like a good fit. • For a limited time, score a free SIM! Use promo code FREESIM at checkout. Even if you have automatic billing on your account the company has not charged many customrs. Instead of notifying you that your credit card or account is past due. Frontier simply shuts off your TV or internet service. This has happened to several customers in the area. To make problems worse, departments within Frontier do not talk to each other. You first have to speak with collections and then collections send you to another department. It often take 5 to 10 calls just to reach the right person who knows how to turn you service back on. It is probably the worst customer experience ever. The amount of incompetence by the customer service teams is really amazing. Time Warner / Spectrum was hanging around our office building. They were able to hook up internet service in less than 12 hours. We dumped Frontier's service today after waiting 6 days for the service to come back on. I would not be surprised to see this company go into bankruptcy or see a private equity company come in a buy them out. The amount of drastic changes that need to happen are obvious to everyone in the marketplace and their stock price reflects this. See all the Tweets below about the problem.